We’re proud to feature our own Forever Essential Oils Lavender, which imparts a soothing fragrance, to help hair shine and support the scalp. We realize it’s important to condition your scalp during shampooing and not just waiting for the conditioner, that’s why we’ve created this new, moisture-rich formula! 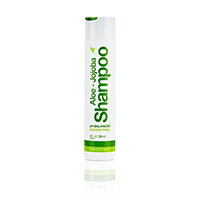 Instead of having to rely solely on man-made sudsing agents, our favorite ingredient, Aloe Vera, naturally supplies saponins which help create a gentle lather. Get ready to have manageable, strengthened, full-bodied hair that will turn even more heads!